Every cocktail has a story! And as bartending is being taken increasingly seriously all over the world, bartenders are getting their due in the spotlight. While the profession may seem glamorous, with plentiful fun, it’s not as easy as showcasing Tom Cruise-style theatrics in Cocktail. Competitions like Glenfiddich’s World’s Most Experimental Bartender give a world-wide platform to qualifying bartenders to showcase their skill. These competitions allow creativity to bloom within given parameters and can also earn recognition for bartenders along with international exposure. Almost 600 bartenders applied online with the details of their experimental serve using Glenfiddich 12 Year Old. Of these, six were chosen and paired with a master of another field to co-create a unique Glenfiddich experience. The trick, however, was that the teams were paired by Glenfiddich India and the collaborators did not know each other prior to the competition. So within a week or so, the bartender created a unique cocktail in keeping with his/her partner’s aesthetics, values or brand image. The best national entries were judged live by a panel of local influencers. The national winner will go on to participate at the global final in Scotland. 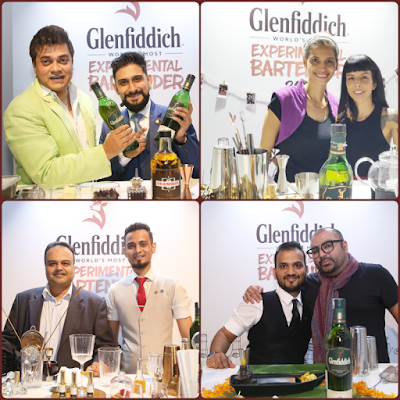 The global winners win a trip of a lifetime to two international bar shows in 2019.
the winners at the India Finale. Rohan Matamary from Big Brewsky Bangalore collaborated with Sonam Kalra, award-winning singer, songwriter and composer. Sonam, who has trained in Hindustani classical music and western music styles that include Gospel and Jazz, is best known for The Sufi Gospel Project which is an attempt to blend the different voices of faith and create one powerful voice, through music. 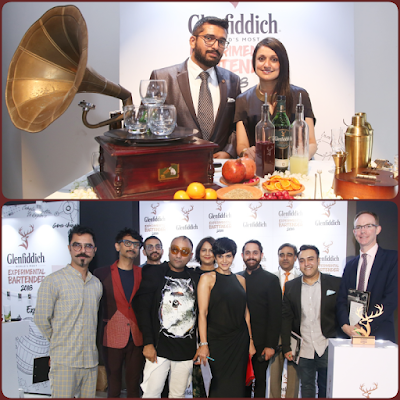 Keeping Sonam’s core values like oneness, inclusivity, equality and hints of feminity in mind, Rohan created a unique Glenfiddich Experience called ‘Zarra’. In this, seemingly opposing ingredients came together homogenously for a tangy cocktail made with Glenfiddich 12-Year-old, cranberry, tiny tangerines, egg white and sage infusion, homemade hibiscus grenadine, rhubarb and a dash of lime. Once all the ingredients were stirred, it was topped with wheat beer and garnished with a dust of aromatised mint blend and a dehydrated tangerine. Chef Saby, who is the recipient of the prestigious ‘Best Chef of India’ award from the President of India, is a force to reckon with in the culinary world. He collaborated with the head bartender of Pra Pra Prank, Sanchayan. Anushka Menon, who began her career at the age of 21, is a leading fashion and beauty photographer. She describes her work as unique – to her it represents the core qualities of strength, creativity, harmony and nurture. She paired up with Ami Shroff, an equally spirited bartender at London Taxi. This is a collaboration of two ancient languages with ingredients of different temperatures blended into one cocktail. Inspired by the basic essentials of photography - light and shadow. Ingredients inspired from the flower power movement and the role photography played in it. Rajiv Sheth, who is the award-winning perfumer behind the brand All Good Scents, paired up with mixologist Soumyadipta from J.W. Marriott, Pune. You can expect to find Krsnaa Mehta’s bold and distinctive home décor designs reflect in the designer’s cocktail, for which he paired up with bartender Alok, from St. Regis. India’s youngest illusionist and the host of his own TV show, Neel Madhav was seen with Dibyendu from The Park, to create a drink that’s no less magical than the tricks he performs.